Mal Fletcher's social commentary has featured in many publications, including: The Sunday Times (Ireland), The Guardian (Online - UK), The Minneapolis Post (USA), Fabulous Magazine (UK), Nya Dagen Newspaper (Sweden), RelevantMagazine.com (USA) and many more. His feature articles have appeared in publications in the USA, the UK, Europe, Australia, South Africa, New Zealand, Germany, the Netherlands and Scandinavia. 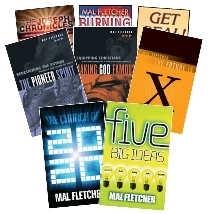 Mal Fletcher has written 11 books to date, released by various publishers. These are available in up to five languages. He also writes extensively for Magazines, E-Journals and for his TV documentary programmes. Mal's first book was published in 1991 and became a classic social commentary on the challenges facing young people of that generation. His more recent titles cover a variety of issues including social change, the future, leadership development, communication and spirituality. He has also contributed to books by other authors. Mal Fletcher's latest title, Fascinating Times, is a social commentary, which takes a sharp-eyed look at a wide range of current issues and explores their impact on social ethics. Released in November 2012, the book covers such issues as the human impact of new technologies and shifting medical ethics, the long-term effects of recession, the future of media and the press, the changing face of consumerism, the future shape of marriage and the family and more. For the Media Release relating to the book, please click here.